Tuner and WB’s SVOD service Boomerang has picked up Cloudco’s new animated series Care Bears: Unlock the Magic. Following a global premiere on the streamer, the Boomerang TV network will showcase a selection of the new episodes for a limited time. The 2D-animated series is currently in production and consists of 48 x 11-minute regular episodes, plus two x 22-minute specials and 20 x 20-second shorts. 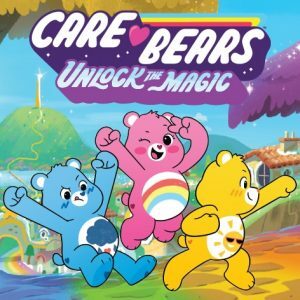 Care Bears: Unlock the Magic is a fresh take on the character-driven classic that incorporates core brand elements such as the Care Bear Stare. Storylines follow along as the bears head out on the road for the first time, and the series takes the franchise back to its 2D-animated roots. The Care Bears first hit the airwaves in a series of specials that launched in 1983, and the brand has gone through many iterations over the years, including the 2015 Netflix commission Care Bears and Cousins. Cloudco Entertainment is a recent rebrand itself. This new company was previously active in the market as American Greetings Entertainment but has recently relaunched as a standalone company independent from its parentco, American Greetings. Turner and Warner Bros. unveiled the Boomerang SVOD service in March 2017 with more than 5,000 titles, including the content libraries of Hanna-Barbera, Loony Tunes and MGM Animation.